Remember the OMT - the ballistic missile Super Mario fired in the direction of the markets to calm the hell out of them and dramatically lower the bond yields for the countries saddled with the likes of the FG/LP/Troika coalitions (known colloquially as 'peripherals')? Sinn is right and he has been right for a very long time. He is on the record clearly indicating that the only way to repair bank balance sheets is for bank creditors to agree a write down of the obligations that banks have towards them. In the Piigs + one other country he did not say which one, these obligations amount to over 8 trillion euro. There is no way the tax payers can repair these balance sheets. 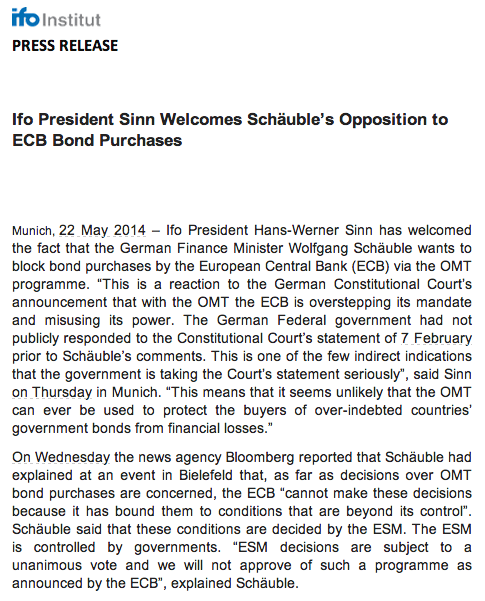 Also, now it is out in the open that, there is no way Mario will be allowed to QE them back to health. So where does this leave us? It leaves us on the edge of another sovereign and banking crisis. If I was down at the NTMA I would be getting as many bonds away as possible before spreads balloon again.